Baby’s tub time may be a bit more relaxing (for everyone!) if she has a familiar friend afloat nearby. The beloved Sophie the Giraffe (most often recognized in its iconic teether form) joins a cast of just as jubilant characters in this sweet, BPA-free Sophie the Giraffe bath puzzle. Wee ones will keep busy fitting the cute animals (Sophie, a penguin, a whale, a snail, a bear, and a ladybug) into different shapes. Apart from the puzzle, each animal toy also floats and sprays water. Thanks to Sophie for sticking her neck out again to keep kiddos happy. Baby's tub time may be a bit more relaxing (for everyone!) if she has a familiar friend afloat nearby. The beloved Sophie the Giraffe (most often recognized in its iconic teether form) joins a cast of just as jubilant characters in this sweet, BPA-free Sophie the Giraffe bath puzzle. Wee ones will keep busy fitting the cute animals (Sophie, a penguin, a whale, a snail, a bear, and a ladybug) into different shapes. 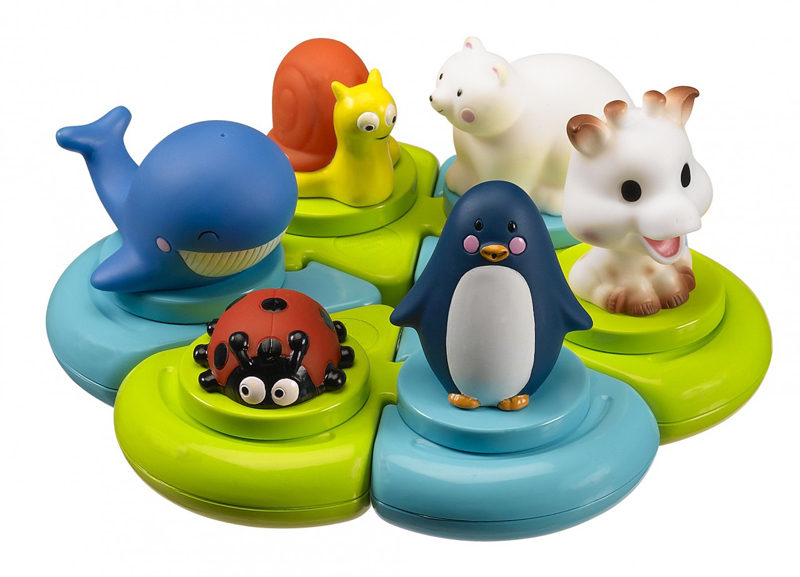 Apart from the puzzle, each animal toy also floats and sprays water. Thanks to Sophie for sticking her neck out again to keep kiddos happy.